The Great Wall of China is the one of the most significant historic element in China and it is the only thing that is rumoured to be seen from the space. And the heavy censorship imposed on the internet use in China has been an issue of debate inside the country. Besides, many humanitarian societies have been against this law for many reasons. Due to the strong imposition, this internet blocking using a national level firewall system has been termed as the ‘Great Firewall of China’. The Chinese residents are not allowed to enter most of the social media websites such as Face Book, Twitter, Google Plus etc. And also file and image sharing websites like Picasa, Flickr and You Tube are also blocked in China. Chinese government also monitors the internet activity of each and every internet user through their Internet Service Providers. And the ISPs are bound to provide all sorts of detailed information to the government. In fact, the whole monitoring issue is easy for the government as all the ISPs had to get internet connection from the Government operated state telecommunication organization. 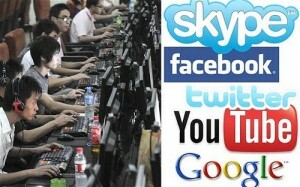 There are various reasons why Chinese government have such strict internet policy.The government tries to mask its activities saying that they are trying to regulate the activities of the people to keep them away from all sorts of harm like pornographic contents, unwanted attacks from the hackers due to the users roaming around in the dangerous websites, people being addicted to social media websites etc. and many more. However, it is a well known fact to everyone that these are not the main reasons. Government is basically being so strict to suppress any sort of opposition that might arise in this era of information freedom. Many people in the past has been put into jails or has been tortured as they have blogged or made websites with their political comments and opinions against the conspiracies or the bad deeds by the government. Along with all those strict Internet rules, government has started to put restriction on the Journalists as well. The Chinese journalists cannot write anymore based on internet postings without prior permission from the government. And in fact even to get the prior permission they have to manage at least two reliable source and sometimes personal interviews are also required. There had been all sorts of regulations and rules on the journalism before. Yet the journalist could get around all those requirements with the help of the internet and the social media sources. And now after this new regulation is in practice, the journalists cannot anymore source back to the micro blogging platforms or any other internet source. In support to this new rule, the government says that in the recent time, the amount of unverified reporting have been increasing at an alarming rate and thus creating a chaos in the country. Therefore, it is required for the journalists to think carefully before sourcing back to any internet posting and report based on that. All the aware citizen and the internet specialists assumes that this new rule is going to hinder the overall information flow whatever was there still. And people will grow desperate to find alternative ways to bypass all these rules. There are following top 5 VPN Service providers for china that are considered best VPN providers.